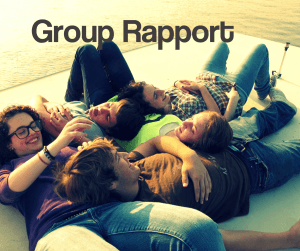 Recently I was asked about how to generate rapport with groups. Since I do a fair amount of public speaking and teaching, it’s a subject with which I’m familiar. Rapport techniques in NLP are based mainly on matching a person’s behavior in some way–posture, breathing, rate of speech etc. Well, it’s challenging to match the posture of 30 people all at once without ending up looking like a pretzel! The techniques can be quite different depending on whether you are leading a group (such as teaching a seminar) or whether you’re simply a member of a group (such as a round-table business meeting). You can use all of the strategies listed above. It’s a good idea to have a group perform some sort of activity which gets them all doing something together. That helps generate a sense of group rapport (be sure to participate). For instance, I often ask people to take a deep breath in, and as they let it out relax their bodies. I explain that a relaxed person learns better and since they’re there to learn, this will help. I take a breath and relax with them. Doing some sort of exercise up front also has the advantage of getting folks to follow your suggestions. That’s the start of a pattern of them following more suggestions! To elicit a state of liking and rapport group-wide, I often ask folks to think about a time where they had a teacher that they liked and who delivered information to them in a way that made it easy for them to learn. I ask “How does it feel” to sit in a classroom while you’re quickly and easily learning material from someone you really like. Motion toward them when you talk about sitting in a classroom and toward yourself as you talk about “someone you really like.” That helps the unconscious mind get the idea that you’d like them to apply those feelings, not only to a past event but to the current situation. If you know how to embed suggestions you can easily spot a few phrases in the above paragraph that can be marked out to the benefit of your students/attendees. I cover how to get rapport in a group you’re not leading, here.